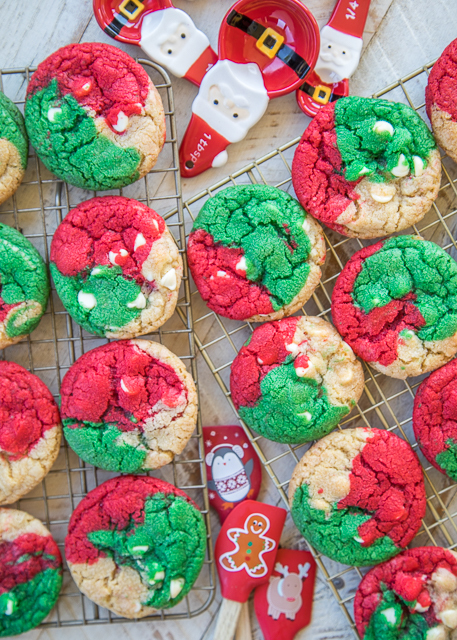 Christmas White Chocolate Chip Cookies - fun, festive Christmas themed cookies. THE BEST chocolate chip cookie EVER! I ate WAY too many of these!! Shortening, flour, salt, sugar, brown sugar, eggs, vanilla, white chocolate chips, gel food coloring. Can make cookies with regular chocolate chips. 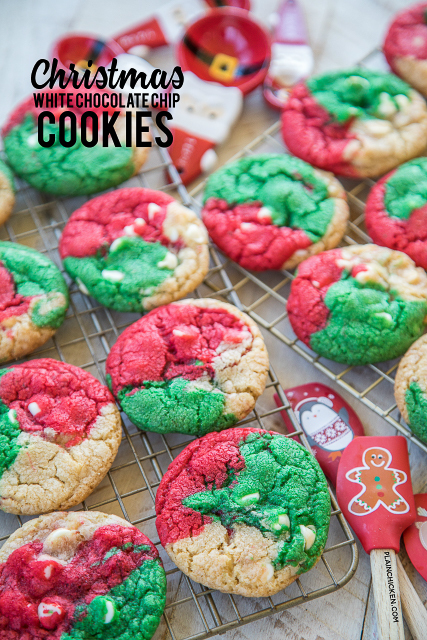 You can also skip the food coloring if you aren't making for #Christmas. Seriously THE BEST cookie recipe!!! Now that we got Thanksgiving out of the way, it is time to immerse ourselves in all things Christmas! 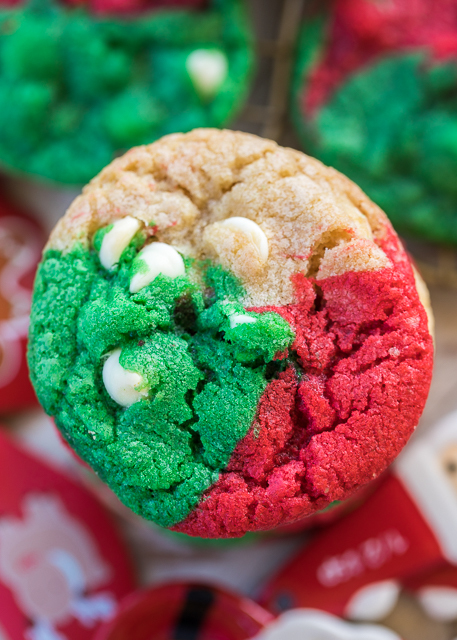 First up are these Christmas White Chocolate Chip Cookies. They are SO cute and they taste amazing! I made these several times, and they are seriously some of the best tasting chocolate chip cookies I've ever eaten!!! 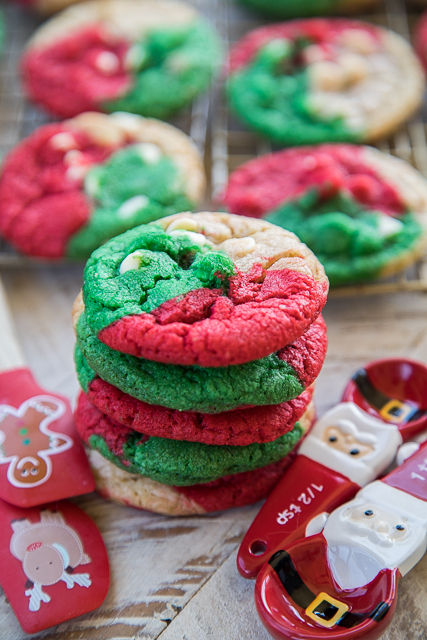 To get the festive Christmas colors, I divided the dough into three parts and dyed one green, one red and left one part plain. I used gel food coloring so the dough didn't get thinned out. I bought the gel food coloring at Hobby Lobby. The gel food coloring is with all the cake decorating supplies. Each bottle is about $2. It will last forever! I tried these with just red and green dough and they ended up looking like watermelon cookies! LOL! That is also why I used white chocolate chips. I didn't want watermelon Christmas cookies!! You can make the dough ahead of time and freeze the dough balls until you are ready to bake the cookies. You can either thaw the dough before baking or just add a few minutes to the baking time. I LOVE being able to whip up some festive Christmas cookies at the drop of a hat. 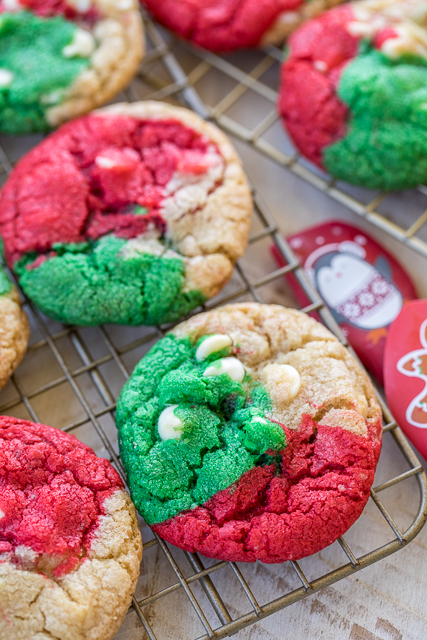 These Christmas White Chocolate Chip Cookies make great homemade gifts. Just whip up a dozen and tie them up with a cute ribbon and you are set! One more thing. This recipe uses shortening. I know several people don't like baking with shortening. I have not made these cookies with butter. If you choose to substitute butter for the shortening, it will totally change the texture of the cookie. I LOVED the cookie just the way it was. I wouldn't change it, but you can totally swap out the shortening for butter. Enjoy!! Preheat oven to 350ºF. Line baking sheets with parchment paper. Set aside. In the bowl of an electric mixer, beat together shortening and sugars until creamy. Add eggs and vanilla. Mix until fluffy. Divide dough into three equal portions. Stir in 2/3 cup of white chocolate chips to one portion. Add red food coloring to one portion - mixing well. Stir in 2/3 cup white chocolate chips. Add green food coloring to remaining portion of dough, mixing well. Stir in 2/3 cup white chocolate chips. Take a two teaspoons of each color of dough, and roll into a ball. Place on prepared baking sheet. Bake for 10 to 12 minutes. Remove from oven and let cool on baking sheet for 2 to 3 minutes before removing to a cooling rack. Does it have to be gel food coloring? I use gel food coloring because it doesn't change the consistency of the dough. You can use liquid if that is all you have access to. It will water down the dough a bit. Anything change for high altitude baking? I live at 4500 ft. Thanks! Would butter or margarine work instead of shortening?